Jackie Walker, Malia Bouattia, Shami Chakrabarti and Dianne Abbott are three women of colour with long histories of standing against all kinds of racism. 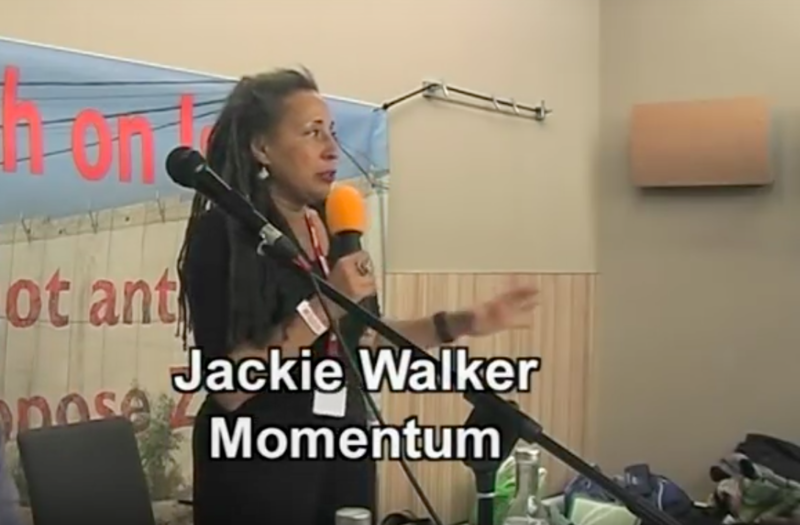 Not only have they not been supported in recent times by Momentum against vicious, racist attacks in the media and by politicians; in the case of Jacqueline Walker she was removed as Vice-Chair of the Momentum Steering committee – a decision made by a mainly white panel with no consultation of its BAME membership. There are many Black Activists and Jewish Socialist Activists across the country who have commented that the national Momentum Steering Committee had a knee-jerk and undemocratic response to the pressure from the right of the Labour Party, pro-Zionist lobbies and the Media. In recent months people of colour, notably the women named above, have been targeted by groups hostile to Jeremy Corbyn’s leadership and Palestine solidarity activists. 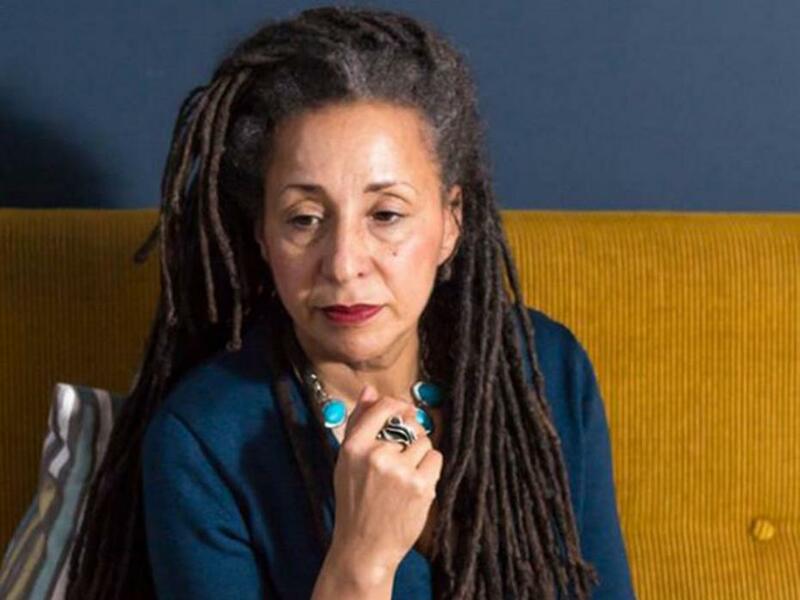 The rapid decisions and knee-jerk reaction of the Momentum Steering Committee in removing Jackie Walker, a lifelong anti-racism campaigner from her post in such circumstances has left BAME Momentum members wondering who is representing them within the leadership. The fight against racism and anti-Semitism cannot be selective and Greater Manchester BAME Caucus abhors any act of anti-Semitism or racism and extends the hand of solidarity to any comrade who has suffered such abuse. There can also be no justification for any form of latent or unconscious racism and therefore we remain perplexed at the actions of the Committee over this matter. If Momentum is truly a People’s movement committed to transforming Britain for the better under a future Labour government, then Momentum needs to learn from its mistakes and listen to its members if it is to have any role in delivering this change. Make a statement that outlines Manchester & Trafford Momentum support for Palestinian rights, opposing Israel’s military occupation of the West Bank, East Jerusalem and Gaza, the denial of the right of return home for Palestinian refugees and equality of Palestinian Citizens of Israel. To paraphrase Oscar Wilde, to be suspended once may be regarded as a misfortune; twice looks like carelessness. But whose? Like all great mysteries, the defenestration of Jackie Walker from the Vice-Chairship of Momentum, and her renewed suspension from the Labour Party, has quite a back story. Where to begin? In 1954 when she was born? On May 14, 1948, Israel’s birth date? On 12 September 2016, when Jeremy Corbyn was elected leader of the Labour Party? In 1920 when the organisation Poale Zion affiliated to the UK Labour Party, or in 2004 when it was re-launched as the Jewish Labour Movement? Or (as with most public accounts of the events causing Jackie Walker’s latest ‘offence’) at 11.30am on Monday September 26, ending one hour later when the training session on antisemitism at the Labour Party Annual Conference in Liverpool limped to a halt. I think that we can do better than that. I will start with that infamous training session and work back. It is by now well known that Ms Walker a) belittled Holocaust Memorial Day; b) said that the fuss about the danger of attacks on Jewish schools was being over-blown; and c) saw no need for definitions of antisemitism. Some facts will intrude on the elegant simplicity of this story. On Holocaust Memorial Day she got her facts wrong, saying that it only commemorated the Nazi Holocaust, and ignored other genocides including that perpetrated on Africans by the slave trade. In fact International Holocaust Memorial Day does in principle mark all genocides from the Nazi holocaust onwards. In practice, however, the commemorations virtually ignore the slaughter of some 2 million Romani, 250,000 mentally and physically disabled and many others under Hitler’s regime, and for example, only pays lip-service to Rwanda. It is the Jewish narrative that dominates. But consider that arbitrary cut-off date. It handily excludes those undoubted but historically inconvenient earlier genocides. Evidently the United States might have felt sensitive about an annual focus on the deaths of so many millions of Native Americans in the eighteenth and nineteenth centuries (even though historians dispute whether this was deliberate – or just stuff that happened). Britain had its significant role in the slave trade and the treatment of aborigines in Australia to keep out of the picture. And so on. The absence from Holocaust Memorial Day of the millions of slaves who died on the Atlantic crossing and then through the brutal conditions of slave labour is no accident, no act of God. And it is no sacrilege for Jackie Walker to point up this glaring omission. It has been taken as read by most mainstream commentators that when Jackie Walker said (while asking a question of the training session tutor, Mike Katz, of the Jewish Labour Movement) that “I still haven’t heard a definition of antisemitism that I can work with”, what she meant was that it wasn’t worth defining because it wasn’t that important. What actually happened before her intervention sheds a quite different light. I was present at the training session, and have also had the advantage of consulting a transcript of the proceedings. This shows that a few minutes before Jackie Walker’s intervention a (Jewish) attendee at the session asked Katz “We don’t know what you’re working from. Do you think you can give us what your definition of AS is?”. Katz replied “The standard definition of antisemitism is actually the European Union Monitoring Centre….” at which point several other members objected that the EUMC definition had no status, was deeply flawed etc. This context clearly shows what definition Jackie Walker was objecting to. The ‘EUMC working definition’ is a cause celebre. It is called a ‘working definition’ because it was never formally adopted by EUMC (which itself no longer exists). When it existed it was the European Monitoring Centre on Racism and Xenophobia. In 2004 it commissioned a definition from a working group, which was effectively taken over by the European Jewish Congress and the American Jewish Committee, both bodies with a strong Zionist orientation. It was in fact the American Jewish Committee’s specialist on antisemitism and extremism, attorney Kenneth Stern, who was the main author of the EUMC definition. Stern is deeply concerned about what he calls “politically-based antisemitism, otherwise known in recent years as anti-Zionism, which treats Israel as the classic Jew. Whereas the Jew is disqualified by antisemitism from equal membership in the social compact, antisemites seek to disqualify Israel from equal membership in the community of nations.” In other words, according to Stern, if you are opposed to the Zionist political project, or indeed advocate a boycott of Israel, then you are an antisemite. So, despite its name, the EUMC definition did not originate in the EU at all but from a pro-Israel lobby group in the USA. With this understanding, the American spellings in the document become understandable. But why take so much trouble over a definition of something so straight-forward as antisemitism? Brian Klug, an Oxford academic who specialises in the study of antisemitism manages it in 21 words: “Antisemitism is a form of hostility to Jews as Jews, where Jews are perceived as something other than what they are”. The EUMC working definition by contrast took 500 words, a whole page. That is because it lists a whole raft of types of statement that can be considered prima facie evidence of antisemitism, most of them about Israel. The purpose, which should have been transparent, was not to define antisemitism as commonly understood, but to extend its reach so as to embrace and proscribe a range of common criticisms of Israel, often called ‘the new antisemitism’, or even ‘antisemitic anti-zionism’. The institutional history of this definition is chequered. It is called a ‘working definition’ because the EUMC itself never adopted it. When the EU closed down the EUMC in 2007 its functions were transferred to the Fundamental Rights Agency, which declined to endorse the definition and indeed removed it from its website. The FRA is on record as stating that it is “not aware of any public authority in the EU that applies it”, and that it has “no plans for any further development” of it. In 2006 the EUMC definition was taken up and promoted in a report by the All Party Parliamentary Group on Antisemitism under its chair (then MP) Denis MacShane. But in 2015 under its new chair, John Mann MP, the group brought out a further report which did not repeat this call. Instead it commissioned a sub-report from Professor David Feldman (later Deputy Chair of the Chakrabarti inquiry) which came down in favour of – the Brian Klug definition. In 2011 my own union, UCU, after one failed attempt to use the EUMC definition internally, resolved at its annual conference to exclude it from any future role in disciplinary cases. In 2013 the BBC Trust agreed that the definition had no standing. This was the ‘definition’ that Mike Katz and the Jewish Labour Movement refer to as the ‘standard’ definition – and which Jackie Walker said she could not work with. The Jewish Labour Movement, mostly under its former name of Poale Zion, has been an affiliated organisation of the Labour Party since 1920. Its origins were as a movement of Jewish/Marxist/Zionist workers across Europe in the early days of the twentieth century. With Jewish immigration to Israel it became a major force there, and through a dizzying series of splits and re-mergers became the origin both of Mapai (Israel’s governing party for decades) and of its left rival Mapam. In 1920 Poale Zion in the UK could be seen as an authentic representative of the then numerous Jewish working class. In the 1930’s its supporters included Labour NEC member (later party chair) Harold Laski. Postwar it retained influence – this was a period when almost all progressive people in the UK were moved by the trauma of the holocaust, excited by the socialist experiment of the kibbutz movement, and admiring of ‘plucky little Israel’ trouncing its many Arab neighbours. Prominent parliamentary backers included left icons like Ian Mikardo and Sidney Silverman. In 1946 Poale Zion had 2000 members. How things have changed. Nearly 50 years of illegal occupation and settlement, population punishment by blockade, and the repeated deployment of a formidable state killing machine against civilians with nowhere to hide long ago ended the love-in. Large swathes of the left, and indeed of the centre ground of British politics, believe that the automatic support for Israel by the governments of the UK and other developed countries is both morally indefensible and in the longer term pragmatically disastrous. How did all this affect Poale Zion? In effect it shrank, and despite a 2004 attempted rebrand as ‘Jewish Labour Movement’ became inactive and nearly invisible. It remained, as it still is, affiliated not only to our Labour Party but also to the Israeli Labour Party and the World Zionist Organisation. However as late as 2015 its website remained totally inactive, though it seems to have maintained an email list. In February 2016 its chair Louise Ellman MP (who during this year’s Labour Party conference in Liverpool asked for her own constituency Party in that city to be suspended on grounds of entryism) stepped down, to be replaced by Jeremy Newmark. It is from that point on that a new, brash and aggressive Jewish Labour Movement leapt into view. There is no publicly available information on where its evidently ample funding comes from. Newmark is active in his local Labour Party, but was until the other day far more known for his former role from 2006 until 2013 as Chief Executive of the umbrella group the Jewish Leadership Council (JLC). Before that he was communications director for the then Chief Rabbi Lord Sachs. Clearly Newmark is a man with a mission. It seems to be the identification and rooting out of antisemitism. And his arrival on the national Labour Party scene has coincided with the uproar about left antisemitism. What surge in antisemitism? We do know that antisemitic incidents reported in the UK in the first 6 months of this year, as recorded by the Community Security Trust, rose by 15% above those for the previous year. But percentage changes like these tell only part of the story. The actual number of such incidents recorded for the first half of 2016 was 557. And that figure is still below that for 2014, which were boosted by the Israeli assault on Gaza, so no surge. By comparison, the official figures for hate crimes of all types in the UK has averaged over 220,000 annually over the most recent 5-year period. Antisemitism is a foul attitude which has had dire effects over the centuries. Vigilance is needed. But right now in the UK it manifests itself as a pimple on the bum of the far too many other offences committed out of hatred or fear of the Other. Is it possible that despite the low levels of antisemitic behaviour in the general population there is significant antisemitism within the left and specifically the Labour Party? Attempts have been made to show that such views are either historically endemic on the left, or brought on by the Corbyn ascendency. (That these explanations are mutually contradictory is glossed over.) Those who really want to see this argument in extenso could consider reading David Rich’s recent book, timed for publication just ahead of the Labour Party conference. But there is contrary evidence. In response to a moral panic about Left antisemitism seemingly expanding without limit, the group Free Speech on Israel coalesced in April out of a loosely-knit band of Jewish Labour Party supporters. Some 15 of us got together at a couple of days’ notice for the inaugural gathering. We found that over our lifetimes we could muster only a handful of antisemitic experiences between us. And, crucially, although in aggregate we had around 1000 years of Labour Party membership, no single one of us had ever experienced an incident of antisemitism in the Party. Some time in May the ex-Chief Rabbi Jonathan Sacks was interviewed on Radio 4 about the antisemitism ‘crisis’ by now gripping the nation. Helpfully his interviewer invited him to share some of his own personal experiences of antisemitism. His response, from memory ran rather like this: “Well….actually I have never experienced antisemitism myself. Which is odd, because most people know that the Chief Rabbi is Jewish”. The ex-Chief Rabbi and Free Speech on Israel are at one on this, if on little else. How then do we make sense of a ‘crisis’ for which evidence is so lacking? Well, one solution if you want a crisis and lack enough evidence is to invent some. Another is to redefine innocent behaviour as evidence of criminal intent. The ‘crisis’ seems to have taken off big-time in February this year with the allegations (now known to be fabricated) of rampant antisemitism in the Oxford University Labour Club, leading to the establishment of an enquiry under Baroness Royall. Yet this ‘fact’ was factitious. The two students who made the claims have (respectively) resigned from the Labour Party and been kicked out of it! Both seem to have been supporters of another party. One of them formerly worked at BICOM, the well-funded PR operation that promotes Israel’s image. Curiously the mainstream media continue with their established narrative. Do their journalists investigate? Can they read? Since the answer to at least one of these questions must be ‘yes’ we do need to look for another explanation of why, and indeed how, a crisis of antisemitism in the Labour Party which doesn’t actually exist has become a ‘fact’. If I were to say that there was a conspiracy to make this happen I would no doubt be accused of antisemitism (Jewishness is no defence) for an antisemitic trope and condemned to one of the circles of hell (the 6th probably), or at least suspension. So I won’t. But anyhow conspiracy was almost certainly unnecessary. There is a community of interest plus overlapping membership. It is impossible to know from the outside exactly what and who have made this moral panic go with such a swing. Key individuals may well be Jeremy Newmark, well-placed in JLM, though only just in time, to fan these flames. The wily Mark Regev took up his post as Israeli ambassador in London at the start of April. 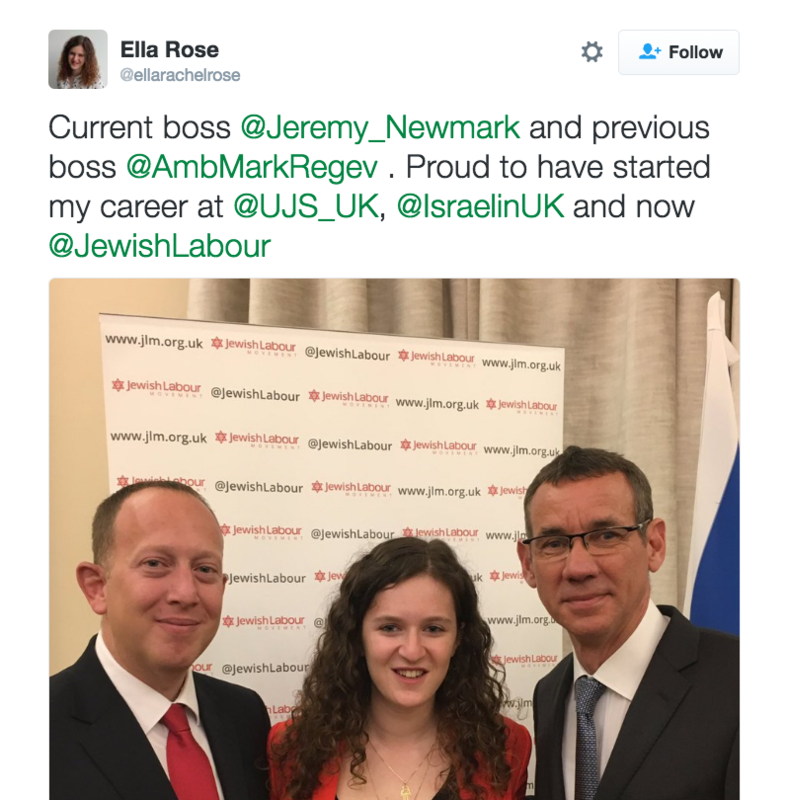 In July Ella Rose left her job as public affairs officer at the Israeli Embassy to become Director of JLM. Who knows? Organisationally, judging by their public pronouncements there is an at least informal coalition of forces involving JLM, Progress (the Blairite pressure group), and Labour Friends of Israel which have all been promoting the idea that the left is permeated with antisemitism. What has made this alignment of forces a natural is that they have all wanted the same thing – the ejection of Jeremy Corbyn from the Labour leadership. The Blairites (but let’s not forget the Brownites) understood that his consolidation in post threatened their whole vision of the Labour Party and its place in an orderly capitalist society with a human face. The Israelis had every reason to wish for a short tenure for the first major party leader in a developed country to have a record of supporting Palestinian rights. All the significant Jewish community organisations, now including JLM, sing from the same psalm book – the refrain is that an attachment to Israel is an integral part of Jewish identity in the twenty-first century. So – if attacks on Israel’s Zionist project of securing the maximum territory with the minimum number of Palestinians can be construed as antisemitic, and this can somehow be blamed on Corbyn, everyone gains. The whole operation has been breath-takingly successful for the last 8 months. And it is not over. JLM, for example, is pressing for a change in the Labour Party’s constitution that would make it (even) easier to exclude people on suspicion of harbouring antisemitic tendencies. It has influence at the highest levels in the Labour Party. The very training session run by JLM that led to Jackie Walker’s second suspension was set up by the Labour Party bureaucracy in direct contradiction of the Chakrabarti inquiry. Their report recommended against such targeted training, and in favour of broader anti-racist education. But, hey, who’s counting? Not the Labour Party apparatus. Free Speech on Israel aims to expose this soufflé of a Ponzi scheme. It rests on the shifting sands of unreliable evidence, and on assertions that contradict our (Jewish and non-Jewish) everyday experience. Not least, the claims about a Jewish community united in its alignment behind Israel is yet more make believe. The best survey evidence we have is that 31% of UK Jews describe themselves as ‘No, not Zionist’; and many of the remainder are deeply concerned over Israel’s policies. We should suspend our belief. Acknowledgement: I have been helped in writing this article by research carried out by The Electronic Intifada’s Asa Winstanley, and by his advice. Jackie Walker was speaking at a public event titled “Jewish Socialists Against the Anti-Corbyn Witchhunt,” Sunday September 25, hosted by Free Speech on Israel. Why I’m reading from a script. You have a situation where the most innocuous video can be used to accuse Jeremy Corbyn of anti-semitism, where my local, once UKIP, now born again Tory MP can make public the names and faces of women suggesting that their protests outside a local arms factory making parts for Israeli drones that drop bombs on Gaza are anti-semites! Being offended is not the same as having experienced racism. I’m asking what is the cost to us as a movement when Macpherson is taken out of context and used against freedom of speech, when, encouraged by disproportionate media attention, claims of racism are weaponised. Where Chakrabarti’s reccommendations seem to me so far to have been pretty much ignored? Jamaican mother of Sephardic descent, Portuguese Jews. Russian Askenazi father left Moscow in 1914 for the US. Met in New York, he was a communist, like many Jews of his time. Committed to fight for the rights of oppressed groups. An Internationalist, he believed the struggle for desegregation and equality for all peoples was part of his struggle. That proud tradition of Yiddish speaking, now mostly destroyed, of Left, universalist, Jewish intellectuals and activists, is the Jewish history I claim as mine and is what I am most proud of. And that is the history that is going to be celebrated very soon at Cable St. I’m not interested in the liberation of one section of humanity, I’m a socialist. I’m committed to the liberation of all humanity. This is what guides my politics – and it is crucial to who I am. My parents were brought together by politics. My black mother was tortured and deported for un-American activities during the McCarthy period, the witch hunt where thought police, denunciations, media frenzy whipped up hatred to enable the Establishment to maintain their control on American society. A witch hunt that terrorized and gripped a nation, a witch hunt that saw many prominent Jews (and by the way I didn’t say all), as well as others, silenced, ostracized, removed from employment. But to move from the general to the particular …. I was suspended from the LP amidst false allegations of anti-Semitism. These allegations were lifted and addressed in parts of the Chakrabarti Report, though given continuing harassment of me you’d barely know it. I’m not responding to those allegations here but if you want to have a look at my response go to JFJFP. We have been told Jews are terrified to go to Labour Party meetings. That women are terrified. That Momentum is anti-semitic (let’s forget that both the Chair and vice Chair and many leading figures are Jewish). I keep reading that the cause of all this terror is Jeremy Corbyn. Interestingly I’ve also read articles claiming that racism only occurred in the Republican party when Obama was elected. Irony is, we have never had a leader so involved in anti racism, not just in theory but in the practice of his life. It’s part of his political and personal DNA. Interestingly, when I’ve responded to critics by pointing this out, apart from being next told ‘Corbyn’s a terrorist sympathiser’ and other nonsense, the response has then become ….. It’s not him, it’s his followers … it’s people like me…. First let me be clear, all racism is abhorrent. I’m not saying that Anti-semitism does not exist in the LP. The LP is after all a reflection of society. I am saying that claims of its significance are being exaggerated for political purposes and this has been done at huge cost to our movement, to communities and to many individual people, in and outside of the party. I’m also saying that anti-semitism is no more ‘special’ than any other form of racism. All racisms have their own characteristics and histories. All genocides their own contexts. All holocaust denial, whether it is of the Jewish or African holocaust, is a blasphemy against humanity. So what purpose do allegations of anti-Semitism have. Why is it happening? Who is paying the ultimate cost? It seems to me there is little, if any, hard evidence that the Labour party has a major problem with anti-Semitism though there is as Chakrabarti says an ‘Occasionally toxic atmosphere’. The most fundamental aim of such allegations I suggest is to undermine Jeremy, silence his supporters, and ensure any chance of an alternative to the neo-liberal diet of cutting services and taxes that has been dished up to us as politics until Jeremy got the leadership never actually gets to the table. Then there’s silencing any criticism, or any potential criticism, of the Israeli state, attacking and undermining anyone who supports Palestinian Rights, the BDS (boycott) movement, ensuring the flow of money and arms to Israel continues unabated and at whatever the cost. This political use of accusations has not only weaponised anti-Semitism, it has became a weapon of political mass destruction and like all nuclear options has entailed a high degree of collateral damage, not just to the Labour movement as a whole. I’m drawing attention here to another, barely mentioned, outcome of this strategy. What is extraordinary, amongst what can only described as a tumult of accusations, is that at this point, when discussion of racism in the Labour party has the most media attention I’ve ever known, is that no person of colour, no group representing the interests of BAME people has been heard, has been allowed to insert their perspective on the debate, let alone be seen as significant to it. Black people yet again have been made invisible. Chakrabarti of course made a number of powerful observations about the exclusion of BAME people from the party, but that voice was soon drowned out against the clamor by the press and others to eke out the story that some seem to prefer; that of anti-Semitism. Blacks may vote disproportionately for Labour, 2:1 – what they don’t have is representation where it counts – in positions of power. This most pressing aspect of Chakrabarti’s report has not just been silenced, we are barely allowed to mention the position of BAME members in relation to Chakrabarti in case we are seen as denying a problem which, as far as I have experienced as a black Jewish woman with a Jewish partner and many Jewish comrades, exists on the margins of the party, and is certainly not reflected in who our representatives are, either within the internal structures of the party or in our representatives in parliament. All this has been aided and abetted by the complicity of a media that at times seems rabidly – anxiously anti-Corbyn. The Boris Johnson style racism of the Tory party that renders Johnson’s cheerful rendition of blacks with watermelon smiles as tolerable enough to see Johnson promoted to deal with the pickeninies (his description of blacks) overseas as Foreign Secretary barely causes a stir. You really have to have a sense of humour, or a very thick skin, black or otherwise, to be involved in anti racism and politics at the moment. And it’s no longer just the Labour right involved in the debate, it’s the right of the Tories (as in my own MP) and the far right joining together in a most unpalatable pact. Fascists in my own constituency in South Thanet, where Farage stood, turn up outside meetings, no longer goose- stepping and shouting ‘Hitler was right’, instead they feel empowered to shout ‘anti-semite’ at Labour and anti-racist activists, telling us how they now like the Jews while screaming abuse against what they call the ‘Muslamics’. Now I’ve had to get used to harassment, and to some extent I have, but for the other victims of accusations of anti-Semitism, publicizing their names and photos across the media and social media …. Has made the vulnerable to threats, to abuse, to threats of loss of employment and worse – it’s terrifying. And by the way, anti-semitism is not, as my MP would have it recently, anything like a virus. It’s learned, not caught, and as such can be unlearned otherwise we would all have to give up, go and live in our separate ghettos …. Calling racism a virus is the language of separation. Racism is about material reality. Racism is, and always has been, essentially about power. In terms of political parties, including Labour, it is most importantly about exclusion from power, lack of representation, voices never heard. As ever, people of colour, marginalized and oppressed for centuries, victims of genocide, holocaust, a stateless diasporic people in this and other Euro-American countries, have been effectively silenced and put into their place – the political abyss. So let’s understand the actions of the right, that their focus colludes with the enemies of our movement, colludes with the exclusion of people of colour from our party… and that they do this and are prepared to do this mercilessly, and with one aim in sight – to further their own political agendas. Let’s talk about the problem about racism in the LP. Here’s my challenge to the right – if you want to talk about racism …..let’s do it, let’s have that discussion please, on a level playing field, together, all sections of the party, all minority groups, and let’s start it right now. Hope not Hate is an organisation well respected for its exemplary work in combating the far-right in Britain and mobilising to confront the fascists when they skulk into public. However for historic reasons Hope not Hate has close links with the British Jewish establishment which has led them to echo the false accusations of antisemitism that FSOI was set up to combat. Fatbellyman, Gary Hollands, has published a detailed rebuttal of Mulhall’s piece on his blog which we reproduce here. Controversy exploded after the release of film footage of a ‘training event’ organised by the Jewish Labour Movement (JLM) at the Labour Party Conference. It was claimed the footage allegedly showed a leading member of Momentum, Jackie Walker, making anti-Semitic comments. All the critics announced Jackie Walker guilty as charged, blithely ignoring one rule of evidence – which is not to take evidence selected by an organisation with a material interest at face value. One article typical of the range of accusations against Jackie Walker was one titled Jackie Walker, The Left and Antisemitism written by Joe Mulhall and published by Hope Not Hate. This article based its condemnation of Jackie Walker using the film footage as well as revisiting old allegations. As this was the apparent judgement of what is one of the more prominent and respected anti-racism organisations I thought a detailed rebuttal appropriate. The reply was posted on the afternoon of Friday 30th September and to date has yet to be published. Below is a reproduction of that post, it’s in its original format, including typos, to maintain a faithful copy as possible. When an author writes serious allegations they have duty to hold themselves to a high bar, to be scrupulously fair in their arguments, to avoid distorting or putting words into the mouth of the one(s) they accuse. Sadly, this article fails badly by that criteria. It is mixture of straw man arguments, distortion and innuendo designed to discredit someone who has actively engaged in anti-racism all her political life. Jackie’s mixed Jewish African-Caribbean and Jewish heritage contribute to what is a fairly unique perspective. While sometimes this can be challenging to those who hold certain viewpoints and political positions it does not necessarily follow that that is anti-Semitic. You refer to a film footage of comments Jackie Walker made at a Jewish Labour Movement ‘training event’. Jackie raised three points in her contribution. You quote Jackie, “Wouldn’t it be wonderful if Holocaust Day was open to all peoples who’ve experienced Holocaust?”. From the filming it’s difficult to discern the whole part of that conversation due to interventions from other audience members and the point was not developed. It should be noted that it’s not good practise to use fragments such as these in the manner you have. “But as a mixed-race person who is African and Jewish, I was making the point that why is the Cambodian genocide, which was after the 1940s, included and the African holocaust is not?” Walker said the criticism should be seen through the prism of the “political differences underlying it”. Now there may be perfectly good reasons for Holocaust Memorial Day not to include the African holocaust but to to construe Jackie’s remark as anti-Semitic is specious. Jackie raised a question on security in buildings used by the Jewish Community, raising the example of her grandson. Unfortunately you don’t directly quote her or inform us that the context was a response to something said by the speaker. “I’m a bit concerned about other (indistinct) that your, your kind of suggestion that the Jewish community is under such threat that it has to use security in all its buildings I have a grandson he’s (indistinct) year old there’s security in his nursery school and every school has security now and it’s not because I’m frightened or his parents are frightened that he’s going to be attacked”. You seem make the claim that this, “also appeared to denigrate the need for security at Jewish schools”, in order to follow up with, “at a time of heightened terror risks and international attacks against Jewish targets…”. That would seem to be more than a little cynical. You seem unaware that there is a live and lively debate over the precise parameters of anti-Semitism as can be seen in a letter [http://www.jlm.org.uk/yjlm] letter to the Guardian from young members of the Jewish Labour Movement disputing positions on Zionism & anti-Semitism held by other Jews. Jackie has since clarified her position [https://www.theguardian.com/politics/2016/sep/29/momentum-likely-to-oust-jackie-walker-over-holocaust-remarks] saying she supports David Schneider’s definition [https://twitter.com/davidschneider/status/780107628500381696]. Jackie is right to point out the Macpherson Principles state that the police should investigate cases reported by the victim or another person as a racist crime but not to accept them as a racist crime. She was also right to raise concerns that some groups hold the view that incidents alleged to be as anti-Semitic then denying anti-Semitism as a motive is itself anti-Semitic. This isn’t raised in the article so perhaps Jackie’s view on this is accepted or is considered uncontroversial. Jackie Walker may be open to the charge of clumsiness or lack of clarity in some of her contributions but I can not see how, singly or collectively, Jackie Walker’s remarks at this meeting constitute anti-Semitism. The article goes on with further accusations. Particularly pernicious is the accusation of Jackie supporting the position of Louis Farrakhan in blaming Jews as a race for the slave trade. 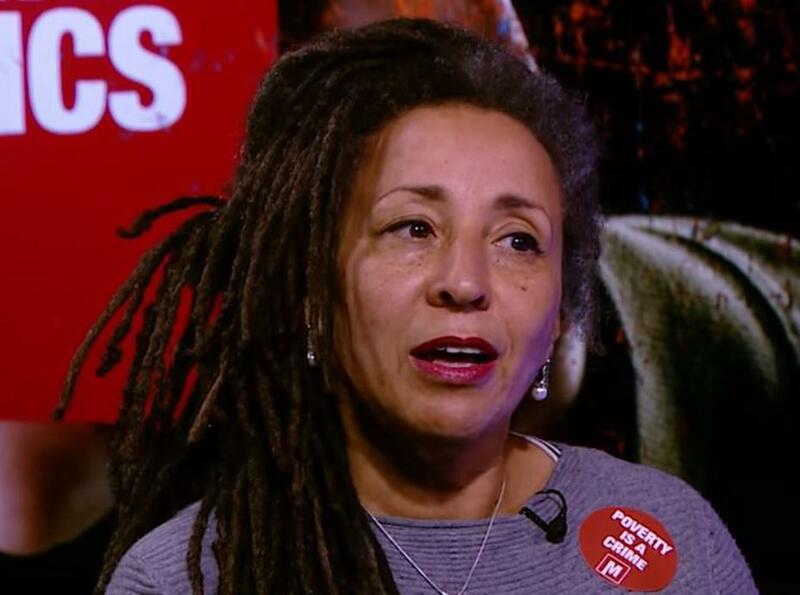 You omit to mention that Jackie was subject to a hearing by the Labour party over those Facebook posts and re-admitted [http://www.independent.co.uk/news/uk/politics/anti-semitism-row-momentum-organiser-jackie-walker-readmitted-to-labour-party-following-racism-a7053966.html]. In conclusion, the allegations of anti-Semitism by Jackie Walker is only sustainable on the basis deliberate misrepresentation and stripping her words of context. What is clear from this article and numerous others is that the attack on Jackie Walker is politically motivated. Jackie has a history of service to the movement in general and is a well known figure on the left. Her expulsion or suspension would be a great prize for her political opponents. It would be disappointing if the Labour Party and Momentum did not give Jackie Walker the support and protection she needs and deserves from what is nothing more than a vicious and vindictive smear campaign. It’s beyond the scope of this piece to conduct a thorough examination of the various definitions of anti-Semitism referred to in the above reply, it’s worth noting that even the UK government point out there is no agreed international definition of antisemitism. It points to the UK’s College of Policing guidance as a working definition of antisemitism. Those activists also raise concerns over the suitability of JLM to run training events. If the footage is from the camera used by JLM to film the event then there may well be a case for them to answer regarding unethical behaviour. Since the reply to Hope Not Hate Jackie has been suspended from the Labour Party. According to media reports Momentum is set to remove Jackie Walker from her post on Monday. I have no relationship with Momentum but I did attend a public meeting organised by them with Jackie Walker as one of the speakers. I was impressed by her depth of knowledge and her eagerness to share and discuss her experience. Jackie is valuable asset to the Labour movement and it would be a tragedy to allow her political enemies to bring about her removal with such dishonest and underhand tactics. I always consider it a proud duty to defend a fellow comrade, especially one who has given so much to our movement. Messages need to be sent by Monday morning as the Momentum steering Committee is planning to meet on Monday to discuss removing Jackie from her position as Vice-chair: Jackie herself has not been invited to the meeting. Individually composed messages are most effective. If you are a Momentum and/or a Labour Party member please quote your Constituency in your message. Please send a copy of your message to info@freespeechonisrael.org.uk so we can let Jackie know of the support we are showing for her. We are publishing the text of four letters sent by FSOI activists for you to quote from or adapt as you wish. As a Momentum and Labour Party member I am alarmed to learn from the Guardian that Momentum is contemplating removing Jackie Walker as vice-chair. I have shared platforms with Jackie and been impressed by her sophisticated understanding of the complex relationship between the twin evils of antisemitism and anti-Black racism. She speaks from an experience that few of us share and we should listen to her with respect. Jackie, as a woman of dual heritage, has to deal with the inherited pain of two Holocausts, the Jewish tragedy and the African horror story. Dealing with one is difficult, managing to live with the impact of both doubly so. No one has developed a language for this. Jackie is trying to provide one, a difficult task in the best and most supportive environment; an almost impossible one when every utterance is malevolently misinterpreted. Jackie is also being attacked for asking for the definition of antisemitism on which the JLM trainers were basing their session, a patently reasonable request. Definitions of antisemitism are highly contested and there is a large literature on the topic, both academic and polemical, which has reached no consensus. Anti-racism training sessions have consistently started from trying to reach a definition, or at least a description, of racism the participants can use to underpin a discussion. It appears that the JLM trainers both know with certainty what antisemitism is and, extraordinarily, are not prepared to share that definition with the trainees. She is being attacked on the basis of leaks from a training session that were definitely unethical and very probably illegal. It is the officers of JLM who should be facing sanctions not Jackie. I am shocked to see Momentum officers dancing to the tune of the JLM and the Labour right-wing, the very people I joined Momentum to oppose and to loosen their stranglehold on thinking in Labour. If you believe that moving against Jackie will increase the security of Momentum and strengthened Jeremy’s position you are more naïve than I believed possible. You are not being enjoined to ditch Jackie to strengthen Momentum and Jeremy but just the opposite. If they get Jackie’s scalp they will not be sitting back saying ‘job done’. They will be setting their sights on their next target and then the one after that to weaken and divide us. I joined other Momentum members in the pub yesterday to celebrate Jeremy’s re-election but what was meant to be a party turned into a bitter contemplation of Momentum’s leadership wrecking an organisation days after the success of TWT [The World Transformed] and wondering if they have a future in a Momentum that treats its best activists I this manner. I have been receiving emails all day from members in other constituencies telling the same story. According to the Guardian, “A spokesperson for the leftwing grassroots movement, which was set up to support Jeremy Corbyn as leader of the Labour party, confirmed members wanted her to go.” I do not know which members the spokesperson was talking about, there has been no consultation and many, many members want her to stay. One of our aims is to democratise the Labour Party; we can’t do that through an organisation that mimics the worst practices of the Compliance Unit and works through a system of kangaroo courts. Please, even at this late stage, draw back from the precipice and do not undermine our hopes for the future. I am writing to you as a Jewish member of both the Labour Party (Chingford and Woodford Green CLP) and of Momentum. I have opposed racism and supported human rights and social justice for half a century – since my teens. Therefore, naturally, I have been a fervent supporter of Jeremy’s leadership of the party from the first. I am also a long-standing supporter of the campaign for justice for Palestine – a position I regard as entirely consistent with the Jewish values I grew up with. It is axiomatic in my family that the mass slaughter inflicted on Jews in Europe should never be inflicted on any other people, anywhere. This past year we have seen Jeremy Corbyn’s socialist project attacked by a powerful combination of forces. Pro-Israel lobbyists, well practised at alleging that critics are motivated solely by hostility to Jews, have handed the perfect weapon to the political and media establishment ranged against him. They assert that criticism of the state of Israel or of Zionism is an assault on Jewish identity and therefore a kind of hate speech. But as you know, many Jews are not Zionists, while plenty of non-Jews are. I chaired a meeting in Liverpool last Sunday where Jackie Walker shared the platform with a British Palestinian lawyer and a leading Jewish pro-Palestinian activist. Her contribution to our understanding of the anti-Corbyn campaign was hugely appreciated by the Momentum supporters who packed into the hall to hear her speak. Jackie’s unique perspective, with her combined Jewish and African-Caribbean heritage and her history of anti-racist, left-wing activism, makes her a hate figure for Corbyn’s opponents. It would be shameful for Momentum to capitulate to the witch hunt which has seen newspapers, broadcasters and social media pundits uncritically reporting every allegation against Jackie and other Labour or Momentum members – of antisemitism, misogyny, bullying and support for terrorism. There is, actually, a nasty whiff of racism and misogyny in their targeting of Jackie. Her Jewish heritage is often deliberately passed over. She has been a victim of distortions and deliberate falsehoods, such as those exposed by investigative journalist Asa Winstanley and still repeated with such frequency that they have become received wisdom, lightly tossed into the conversation in Radio 4 comedy shows. Everybody now “knows” that Jews are not safe in Corbyn’s Labour Party and Jackie Walker is an antisemite. As someone whose mother had been called a Christ-killer when she was a little girl at school, I think I am pretty sensitive to prejudice and stereotyping directed at Jews. I do not tolerate it – nor any other form of racism – in the Labour Party, the Palestine solidarity movement or any other setting. Though I personally I have not encountered it, I acknowledge that antisemitism exists in the party, as in the rest of society. There are recommendations in the Chakrabarti Report that would – if implemented – strengthen the party as a bulwark against all forms of racism, which is absolutely essential in the post-Brexit world. Jackie will be a great asset in building our anti-racist movement. I have been alarmed at the reluctance of our side to fight back. Jeremy has been incredibly conciliatory, restricting himself to pleading his own impeccable anti-racist credentials and swearing to stamp out the antisemitism that is alleged but not proven, thereby giving credence to the idea that Labour does indeed “have a problem with Jews”. Jeremy Newmark of the Jewish Labour Movement, in a debate at The World Transformed on September 25, used the fact that Jeremy had set up the Chakrabarti Inquiry, to explore antisemitism and other forms of racism, as proof that antisemitism was the huge problem the JLM alleges! We are in a Kafkaesque, looking-glass world where querying the veracity of an antisemitism allegation is taken as proof of antisemitism. Let’s throw in Catch 22 and a dollop of McCarthyism for good measure. Sacrificing Jackie will not do anything to keep the circling sharks at bay. Please respect the voices of the vast number of Momentum supporters who value Jackie’s contribution and will feel disillusioned and betrayed if she is forced out. We are Jewish members of the Labour Party. We are writing to you concerning reports in the press, which you have not denied, that Momentum’s Executive Committee is preparing to throw Jackie Walker to the wolves at its meeting next Monday. The reason for this is because of the wholly false anti-Semitism accusations that have been leveled against her. We urge you not to remove Jackie as Vice-Chair of Momentum. When a comrade is under attack then you defend them and extend the hand of solidarity. An injury to one is an injury to all. Betraying a comrade in order to ease the pressure on you is contrary to all Labour movement traditions of solidarity. The Jewish Labour Movement [JLM] will not stop at Jackie Walker. They will look for new targets for their ‘anti-Semitism’ witch hunt. The JLM is not an ordinary affiliated socialist society. It has a close relationship with Israeli state agencies, for example its newly appointed Director, Ella Rose, came directly from the Israeli Embassy. The ‘anti-Semitism witchhunt’ over the last year has been a carefully orchestrated and co-ordinated affair alongside papers like the Daily Mail. Jackie is but the latest target for those who are using ‘anti-Semitism’ as a means of attacking Jeremy Corbyn. The JLM invited to Labour Party Conference representatives of Ha Avodah, the Israeli Labour Party. This is a party that presided over the forcible expulsion of ¾ million Palestinian refugees and placed Israel’s Arabs under military rule until 1966. The ILP initiated the settlements in the West Bank. Earlier this year, its leader Isaac Herzog stated that the ILP mustn’t be identified as an ‘Arab lovers’ party. If Jackie Walker had talked about ‘Jew lovers’ then the charges of anti-Semitism against her would be justified. Herzog later described his ‘nightmare’ of waking up to find that Israel had an Arab Prime Minister. If Jackie had spoken of her fears that Britain might one day have a Jewish Prime Minister then she would rightly be called an anti-Semite. If anyone should be called out for racism it is the JLM. Jews who are not Zionists cannot join the JLM because of its affiliation to the World Zionist Organisation and its Jerusalem Programme, which speaks of ‘the centrality of the State of Israel … in the life of the (Jewish) nation’. The ‘Jewish nation’ means Jews in Israel or the Diaspora. This includes ourselves and Jon Lansman. The idea that we are Jewish not British nationals and Israel is the centre of our lives is a deeply anti-Semitic one. The Jerusalem programme also speaks of ‘Settling the country as an expression of practical Zionism.’ Settlement means occupying the West Bank and Golan Heights as well as Judaising Israel. That is why Israel is a racist settler colonial state. Last Monday the JLM held an ‘anti-racism training’ session at Labour’s conference. The session was filmed without the agreement of participants and contrary to all ethical considerations. It was then leaked to the media in order to wage a vicious racist attack on Jackie Walker and other Jewish dissidents present. Even before the ‘training session’ the JLM had been conducting a political lynching of Jackie. It had refused to accept that the false accusations made against Jackie, that she had alleged that Jews were the main financiers of the slave trade, were untrue, despite her being acquitted of these allegations last May. Instead of stabbing Jackie in the back and running scared of the media’s faked concern for ‘antisemitism’ you would be better spending your time finding out why the JLM was allowed to undertake an ‘anti-racist training session’ in the first place. What Jackie Walker said may have enraged the Zionists, for whom the holocaust serves primarily as an ideological justification for Israel’s crimes, but it was not anti-Semitic. It is a fact that Holocaust Memorial Day has focused almost exclusively on the Nazi holocaust and has ignored the extermination of the Disabled and the Gypsies. The doyen of Zionist holocaust historians, Professor Yehuda Bauer argued, in a debate with the late Dr Sybil Milton, Senior Historian at the US Holocaust Memorial Museum that ‘the Nazis only attempted to annihilate one people, the Jews: Roma were not Jews, therefore there was no need to murder all of them.’ According to Bauer, ‘the Holocaust is very much a unique case.’ [“Gypsies and the Holocaust” Yehuda Bauer; Sybil Milton The History Teacher, Vol. 25, (Aug., 1992)]. As the late Elie Wiesel put it, to compare the sufferings of others with Jews was a “betrayal of Jewish history”. [Elie Wiesel, Against Silence, v. iii, 146.] The truth may be uncomfortable but it is not anti-Semitic. We are seriously disturbed by the report in the Guardian Momentum likely to oust Jackie Walker over Holocaust remarks and a similar report in the Independent that ‘Senior members of Momentum are “fuming” at her remarks’. It is your duty not to betray comrades. The JLM voted 92-4% in favour of Owen Smith. Anti-Semitism is a weapon to attack the left. Any betrayal of Jackie Walker will be unacceptable to grassroots Momentum supporters who are sick to the back teeth of the cynical use of anti-Semitism to ward off criticism of Israel. We also understand that Jackie Walker has not even been invited to the meeting which it is intended will dismiss her. What kind of democracy is this? Because of the racist abuse she has received from the JLM’s supporters Jackie has had to suspend her Twitter account. Of, not being an MP, this kind of abuse will not make the headlines. Jackie is suffering extreme abuse which the JLM has given a green light to. Abuse which openly states that Black people can’t be Jewish. If you attack Jackie you will be a party to this abuse. We are writing to you to demand that you stand up to the JLM when it demands the head of a well respected Black and Jewish anti-racist. You will not be forgiven if you betray her. I am really concerned that as founder of Momentum your response to the anti-semitism witch hunt has not been more robust. Your advice to Momentum groups up to now has been that they should simply publish short statements condemning anti-semitism. Well, shouldn’t that be a given? You told them the problem would quickly go away if they did this. Well it hasn’t. Why have you been leaving those of us who have been suspended or complained against to be falsely harangued in the press and to be at the mercy of a grossly undemocratic complaints procedure in the Labour Party that fails even to tell those suspended or complained against the grounds for the complaint and leaves them dangling not having any time scale for an investigation.In my case I haven’t even been informed of the complaint and just heard about it through the press and rumour. It must surely be crystal clear to you that this sudden so called rise in anti-semitism in the Labour party is a cynical move to rid the party of Jeremy Corbyn, a leader who is both truly on the left and who has always been a campaigner for justice for the Palestinians. Not only has this campaign by the JLM and the right of the party brought the party into disrepute and split it in a way that will make it harder to rid us of the Tories but it has totally debased the meaning of the term anti-semitic and whipped up a problem that was barely there before. Apart from some exceptions we Jews in the UK have been so fortunate that until recently we have been free of the kind of discrimination that other Jews have faced at different times. Even the former chief rabbi said he had not really experienced any incidents of anti-semitism. I was at the training meeting that Jackie Walker attended during the Labour party conference. People may not have agreed with all she said but there was no way it was anti-semitic. She was doing what the trainer several times urged us to do, namely engage in debate. I have been at meetings in Liverpool where Zionist members of the community have come and heckled loudly and made their loud contributions but nobody ran to complain that they should be suspended or expelled or reported to the police. The occupation of Palestine and the actions of the Israeli government are emotive subjects and it is vital that people of different shades of opinion get together to discuss even if it is very painful at times. Manuel Cortes is now bullying Momentum into taking action against Jackie Walker by threatening to reconsider TSSA’s support for Momentum if Jackie is still in post in a week’s time.His use of hyperbole is phoney and disgraceful.He talks about Jackie “holding such abhorrent racist views” . How can we discuss openly and with trust if those of us who hold views that don’t agree with pro Israel and pro zionists are vilified in this way? Momentum itself is now the subject of concerted attack for being a hard left secretive body within the party. You surely realise that this too is just another form of attack on Corbyn? We at the grass roots are fighting off these accusations. Please do the same and stand by Jackie and the rest of us as we will try and stand by Momentum. You have done wonders in growing the Labour party. Don’t desert us when we most need your support. conference, which was a closed event but nonetheless secretly recorded. for Holocaust Memorial Day to be more inclusive? accepted as THE standard definition. Newmark, who was at that time the CEO of the Jewish Leadership Council. give Labour Party members reason to doubt how constructive a role he and his organisation are likely to play in providing any training concerning antisemitism or winning Jewish voters. to the EUMC “working definition”. She is quite right not to accept it. antisemitism and how the party can identify and combat it. We are Jewish Labour activists who were with Jackie Walker at the training session on antisemitism led by Mike Katz, vice chair of the Jewish Labour Movement (JLM) during the Labour Party conference in Liverpool on Monday September 26. Like her, some of us were heckled when we raised questions unpalatable to others in the audience who share the JLM’s bias towards Israel, its coupling of Jewish identity with Zionism and its insistence on the uniqueness of Jewish suffering. Jackie had every right to question the JLM’s definition of antisemitism and the tendency of mainstream Jewish organisations to focus entirely on the slaughter of Jews when they commemorate the Nazi Holocaust. We share her determination to build greater awareness of other genocides, which are too often forgotten or minimised. Jackie responded appreciatively when one audience member described Holocaust memorial events involving Armenians and others. She has since issued a statement on this issue, reproduced below. We were shocked at the way the level of barracking rose as soon as Jackie began to speak. JLM supporters demonstrated contempt for her as a Jewish woman of African heritage who is a lifelong anti-racist advocate for the rights of minorities and a leading Labour Party activist in her Thanet constituency. We unreservedly condemn allegations of antisemitism made against Jackie Walker. Calls for her to be disowned by the Momentum movement of which she is vice-chair, and for her to be suspended for a second time from the Labour Party, are reprehensible instances of the witch hunt to which she and other Corbyn supporters have been subjected over recent months. The way Jackie has been treated demonstrates the unfitness of the JLM to deliver training on antisemitism. It is an organisation committed to one, contested strand of Jewish labour tradition to the exclusion of any other; it relies on a definition of antisemitism that conflates Jewish identity with Zionism; and it exploits its interactions with party members to set the limits of political discourse about the Middle East in accordance with its own partisan ideology. By promoting the witch hunt, the JLM has helped to relegate the vile prejudice of antisemitism to a tool in the armoury of pro-Israel advocates, backed by Corbyn’s enemies in the political and media establishment. “A number of people made comments in a private training session run by the Jewish Labour Movement. As we all know, training sessions are intended to be safe spaces where ideas and questions can be explored. A film of this session was leaked to the press unethically. I did not raise a question on security in Jewish schools. The trainer raised this issue and I asked for clarification, in particular as all London primary schools, to my knowledge, have security and I did not understand the particular point the trainer was making. Having been a victim of racism I would never play down the very real fears the Jewish community have, especially in light of recent attacks in France. In the session, a number of Jewish people, including me, asked for definitions of antisemitism. This is a subject of much debate in the Jewish community. I support David Schneider’s definition and utterly condemn antisemitism. Defenders and opponents of Labour leader Jeremy Corbyn will clash over interpretations of Zionism and antisemitism in three separate meetings in the space of as many hours on the first day of the party conference in Liverpool on Sunday September 25. 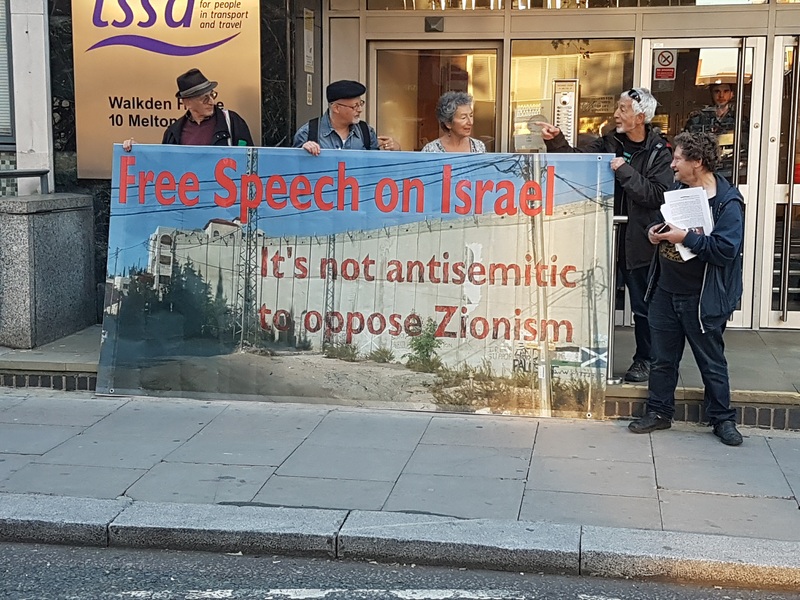 The spectacle comes about because of an initiative by Free Speech on Israel (FSOI), a network of mainly Jewish activists opposed to the deployment of antisemitism allegations to silence Corbyn supporters who campaign for justice for Palestine. FSOI has organised a separate meeting titled “Jewish Socialists Against the Anti-Corbyn Witchhunt”, also featuring Jackie Walker, at the nearby Novotel later the same evening. It will pose a direct challenge to the silencing of pro-Palestinian voices, while the JLM – one of the main architects of the silencing – has chosen to hold its own rally at the same time. Momentum vice-chair Jackie Walker is a lifelong anti-racist campaigner of both African and Jewish heritage who has been suspended from the Labour Party for alleged antisemitism and then reinstated. Free Speech on Israel rejects the assertion, by die-hard supporters of Israel such as the JLM, that expressions of opposition to the political ideology of Zionism are equivalent to anti-Jewish racism. FSOI says opposition to Zionism is rooted in defence of Palestinian rights, which have been abused by Israel since its creation. At the Free Speech on Israel (FSOI) meeting at the Novotel, 40 Hanover Street, at 7.30 pm, Jackie Walker will share the platform with British Palestinian lawyer Salma Karmi-Ayyoub and Glyn Secker, who captained the Jewish Boat to Gaza organised by Jews for Justice for Palestinians in 2010. The vessel was seized by Israeli forces as it attempted to breach the siege of Gaza. The Momentum meeting at 5pm at 1 Great George Street will feature Jackie Walker, Jeremy Newmark (Chair of the Jewish Labour Movement); Rhea Wolfson (recently elected to the Labour NEC) and FSOI speaker Professor Jonathan Rosenhead. The JLM has devoted all its energies since Jeremy Corbyn took over as leader to denouncing him for failing to root out party members sympathetic to the Palestinian cause. It has been a prime mover behind the idea that Jewish identity is inextricably linked to Israel and Zionism. Its meeting, which coincides with the FSOI event, is advertised as a Rally Against Racism and Antisemitism, although the organisation has no record of anti-racist campaigning.